The polar bear growls, originally uploaded by The Bacher Family. 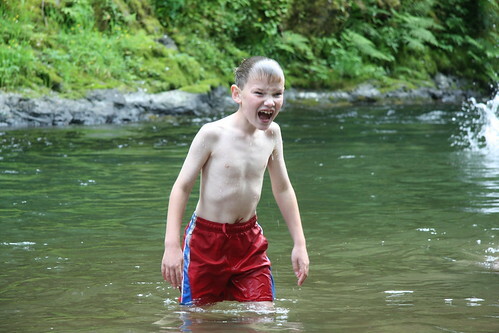 Daniel was attending camp at Drift Creek Camp, where in June the creek is as cold as if it had just bubbled up from a spring fed by recent snowmelt... which, of course, it had. Yet he was determined he was going to dunk under the water not once, but five times. This photo captures him coming up from one of his last dunks.